6/2016 update – Hi there! A much more thorough and complete discussion of this topic (including much of the information below) can be found now on my new site Yoga Anatomy Academy. Check out the updated blog post! About a year ago, I injured my knee after a little under a year’s worth of Mysore practice. There wasn’t anything sudden, but I believe that I may have torn something in the outer knee, over time, that was caused and exacerbated by externally rotated, bent knee poses (of which there are many in the Primary Series!). I stopped Mysore and stopped doing any poses which seemed to cause more pain (externally rotated, bent knee). It seems to have gotten much better, but I’m wondering 1) what I may have torn, 2) if its possible that “time healed everything,” 3) your suggestions on ways to stabilize the knee in externally rotated, bent knee poses. EB, You know this, but most readers may not: The knee is at its most vulnerable when it is in flexion (bent knee) with external rotation (front of the thigh moves to the outside) of the hip, with the foot not on the ground. Examples of this position in yoga asana include: sukasana (easy pose – basic cross-legged seated) padmasana (lotus pose), and eka pada sirsanana (foot behind head pose). 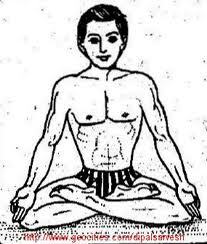 One could argue that Virabadrasana II (Warrior II) falls into this category as well, though because it is closed-chain, foot on the ground, it is not as cautionary. In my opinion, each named style of yoga asana has strengths and weaknesses. Generally speaking, one of the vulnerable physical components of Ashtanga yoga (“Mysore” implies a daily morning self-paced Ashtanga practice) is repeated pressure on the lateral (outside) knee since the practice sequence repeats daily (although there are many many benefits to practicing a structured, set sequence daily, one downside is it sets up the body for repetitive stress syndromes). Only a hands-on physical examination or imaging will give you definitive diagnosis, but the lateral collateral ligament (LCL) connects the outer thigh bone to the outer shin bone, so it’s not unreasonable to guess that you have strained your LCL. To risk stating the obvious, the knee functions optimally when used like a hinge, bending and straightening without much twisting or side stretching. Twisting, when the shin bone and femur turn to face different directions relative to the other, can damage the meniscus. The crescent-shaped meniscus (actually menisci – two per knee) fills the gaps between the two bones like a wedge and is most easily torn where it tapers off to a point. Side stretching of the knee, a la RGIII, pulls on the collateral ligaments on the inside (medial aspect) or outside (lateral aspect), possibly creating micro (visible by microscope only, cells pulled apart) or macro tears (damage to the tissue). Real-life injuries and movement rarely happen in a single plane, meaning there’s often a combo of side stretch, twist and regular old hinging when a knee is injured. Both of the above injuries are notorious for slow healing because of limited or lack of blood flow. This is important since circulation is the main highway system your body uses to transport healing components (white blood cells, etc.). Time helps, but unfortunately, does not heal all wounds. A skilled manual physical therapist can help increase the blood flow to the injured zone and lead you to the precise exercises to decrease your symptoms. When a ligament is torn, unless the tears are tiny-tiny, new fibers are laid in the gap, and their effective strength is neither as great, nor is the proximity of the joint as close as with the original structures. Let’s take a closer look at padmasana. To achieve lotus pose, 99% of practitioners use their arms to finagle the legs into position. When you use muscles outside of the limb itself to achieve that limb’s position, you are in a danger zone. Your muscles are more passive, not engaged in a protective way because they have to be able to give in to the external force. The same can be true when a teacher gives forceful adjustments. Your best option is to strengthen the muscles through their fullest range and do everything you can with the leg muscles themselves before pulling/pushing limbs into position. Know that there will always be a slight amount of pressure into side bend and twist in the knee in lotus pose period, therefore a danger of injury. My advice for yogis entering poses with external rotation of the hip and knee bent, and particularly for Ashtangis, would be to bend your knee fully and engage the muscles along the entire length of the leg –- i.e. flex (dorsiflex) your foot with toe spread — before entering a full pose that requires hip external rotation. 4th – use the external rotating muscles of your hip (not your hands) to lift the inner ankle as high as you can. Try to place it on the opposite thigh without using arms. 5th – keep the engagement through the entire leg and make slow, subtle adjustments using the arms as needed. Repeat on the other side. If you notice any unpleasant sensation – even mild — during entry, hold, or exit of one of these knee flexed / hip external rotation poses, eliminate that pose for at least a few days. If you have a known or suspected knee injury to the meniscus or collateral ligaments, maybe consider eliminating the most dramatically knee flexed/hip externally rotated poses for good. *** Enjoyed this post? Do you know others who could benefit from reading it? Tweet it. What would you add? I’d love to read it in the comments below.